Yahoo has announced that one of the top executives from Google is taking over as their new CEO. Marissa Mayer resigned from her position at Google via telephone on Monday and will join Yahoo on Tuesday, ending her 13 year career with the search giant. She will join a short list of women holding top spots at their respective companies, most notably Meg Whitman of HP and Virginia Rometty at IBM. Mayer, who was Google’s twentieth employee and their first female engineer, has been described as one of the few public faces of the company. She got her start as a computer programmer but eventually worked her way up the corporate ladder, most recently being put in charge of Google’s location and local services division that includes Google Maps. Mayer is responsible for the look and feel of several key products for the search giant including the plain white Google search homepage, Google News, Gmail and Google Images. 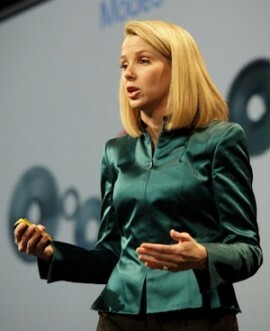 The opportunity at Yahoo will allow Mayer to “step out on her own and claim a bigger stage,” as the NY Times puts it. The publication also notes that this won’t be her first time venturing away from Google. In April, she joined the board at Wal-Mart, becoming one of four women to hold a seat on the 16-person board. Some media outlets are describing the decision as a bit of a surprise as many expected interim Yahoo CEO Ross Levinsohn to get the nod. Levinsohn took following Scott Thompson's resignation in May after it was revealed that he had lied about his educational background on his resume.